Yesterday when I was going home, I was knee-deep ploughing through the snow when I was thinking I had never walked through that much snow in my life. (To be completely honest, I should clarify that I was walking next to the path through the pile of snow which had been cleared from said path. So the snow was only (very) locally knee-deep. Well, not actually knee-deep. But almost. Now, where is the fun in walking ON the path? But then it struck me: I had. Walked through that much snow, I mean. When I was 10. It was an experience never to forget and I’m sure you’ll soon understand why. I was on my first skiing trip with the whole family when I was accompanying my dad to one of the ski-lifts. The lift was located a bit off-track, down a small but steep slope and when we got to the top of the slope, my dad wanted to say goodbye (there was no way I could go with him on the lift because the track at the end of it was way beyond my 10-year-old capabilities). But I refused – the line at the lift was long and I thought I could stand in line with him and chat a bit and then return when he got on the lift. I was in full my-dad-is-a-superhero-phase at the time, and I needed to be with him every possible moment ;). So the moment came – my dad got on the lift and I got out of line to return and wait for him at the bottom of the track he was planning to do. I had learned how to ‘climb’ a slope by taking small parallel steps with my skis, and thus I began to climb the small slope that separated me from the center of the ski-area. However hard I tried, however slowly and concentrated I did what I was taught – the slope was too steep and I kept sliding back down. Time for plan B: take off the skis, and kick little holes in the slope as to make some stairs to climb up. I soon discovered that it would be hopeless if I also had to carry my skis, so I decided to abandon them (my superdad could pick them up later). But skis or no skis, the snow on the slope was so hard that I couldn’t possibly make the holes deep enough for me to find some stability. By that time my sister had also joined me – she had found me struggling at the bottom of the slope and decided she had to help me. So despite my efforts to keep her up (“Don’t come down, you’ll never be able to get up there again!”), she came down. And despite her fighting spirit, we found no solution. We were trapped. I am not so sure what happened next. I remember getting annoyed by the stiff skiing boots that are great for, well… skiing, but not so much for walking around, and even less for climbing a slope. I remember coming to the conclusion that the only way to get out of there was to circumvent the slope and go through the woods, where the snow was softer and the slope was less steep. However, I have no clue what got me to decide I had to take of my ski boots and walk back through the woods on my socks. You read that right. 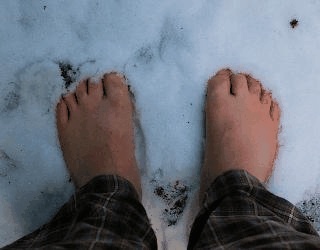 I walked through snow that was literally knee-deep (for a 10-year-old) on my socks. I don’t know if my sister accompanied me on that crazy adventure (I think I “went out to get help”) – my next memory is of me sitting in the hotel, my feet red as they have never been before or after, rubbed by my mum to get the blood flowing again. So here’s the lesson: don’t follow your dad everywhere.